RHYS BOWEN: One of the things I love about being part of Jungle Reds is meeting new writers or coming across new-to-me writers. Today I'm happy to introduce Katherine Bolger Hyde, whom I met earlier this year and now has a brand new first novel to tell us about. It's all yours Katherine..
KATHERINE: What’s your favorite place—real or fantasy—to read? The beach? A cozy chair by the fire with a cat on your lap? A well-stocked home library redolent of polished wood and old leather bindings? I love the sound of all the above. But I don’t often get to enjoy those environments for my own reading. That’s one reason I chose to give my protagonist-sleuth, literature professor Emily Cavanaugh, regular access to all three. Early in the pages of Arsenic with Austen, Emily inherits property in Stony Beach, a fictional small town on the Oregon coast. As a devotee of the traditional English country house mystery, I wanted my heroine to have a country house of her own, so I included one as part of her legacy from her great aunt Beatrice. A mansion on the scale of the typical English manor house would not be credible in a town like Stony Beach, so I scaled it down to a nice seven-bedroom Victorian with a tower overlooking the sea. 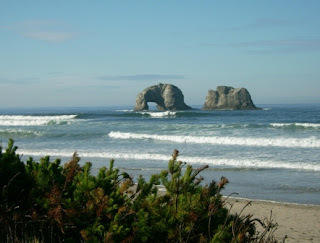 In consideration of the climate of the Oregon Coast and with a tip of the hat to E. M. Forster, I named the house Windy Corner, after the Honeychurch home in A Room with a View. Poring over floor plans is a favorite pastime of mine, and I wanted to have a vivid picture of the interior of the home in my own mind in order to be able to paint it for the reader. 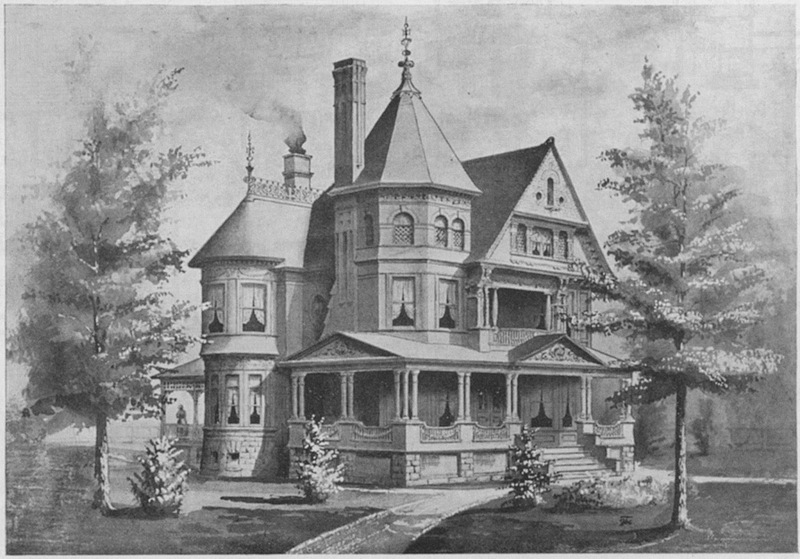 So I bought several books of authentic turn-of-the-century house plans and paged through them until I found a house with an exterior and a floor plan that matched almost exactly what I had imagined for Windy Corner. Here Emily sits reading or knitting with her cats, Kitty, Levin, and Bustopher Jones, curled up nearby. (Cozy chair by the fire with cat: check.) Here she is visited by friends and foes alike; here much of the drama of her new life as an heiress and reluctant sleuth unfolds. 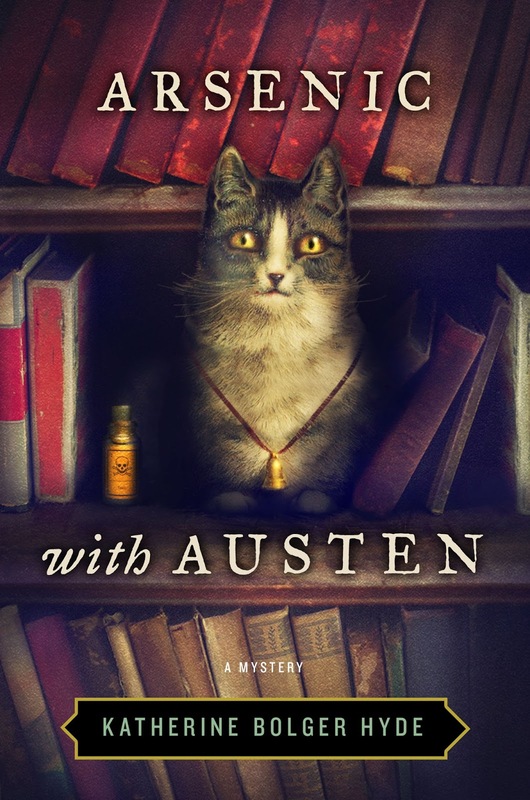 One tiny section of the library is represented on the cover of Arsenic with Austen (along with a cat that must be an intruder, since it doesn’t resemble any of Emily’s three). The library of Windy Corner is a welcoming room where a fire is nearly always burning and high tea is nearly always being served. Emily and I do most cordially hope you will join us there. The magic door to the Windy Corner library may be found at kbhyde.com. 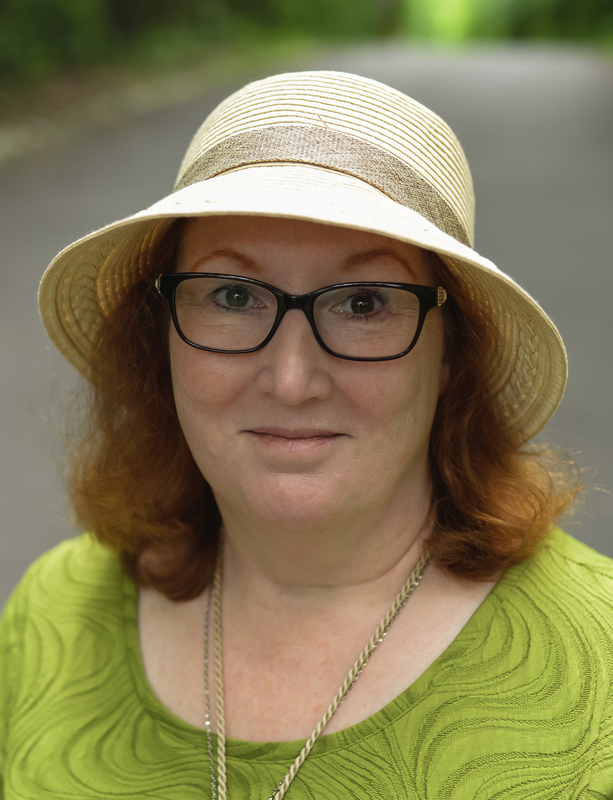 Katherine Bolger Hyde has lived her life surrounded by books, from teaching herself to read at age four to majoring in Russian literature to making her career as an editor. She lives in California with her husband and varying numbers of offspring and cats. Arsenic with Austen is her first novel. When literature professor Emily Cavanaugh inherits a fortune from her great aunt, she expects her life to change. She doesn’t expect to embark on a murder investigation, confront the man who broke her heart 35 years before, and nearly lose her own life. Emily travels to the sleepy coastal village of Stony Beach, Oregon, to claim her inheritance, where she hears hints that her aunt may have been murdered. Soon another murder confirms these suspicions. While she and Sheriff Luke Richards, her once-and-possibly-future love, reenact the plot of Persuasion, Emily uses her knowledge of Jane Austen's characters to analyze the suspects and bring the killer to justice. Congratulations, Katherine, on your first novel, which sounds quite lovely [as does Windy Corner] . . . 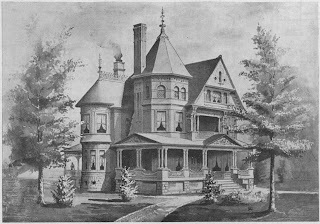 I do believe I envy Emily having that lovely Victorian house! And the cover is absolutely charming. I’m looking forward to reading “Arsenic with Austen” . . . .
How lovely! Such fun to hear where place names and fictional houses come from. ARSENIC WITH AUSTEN sounds like great fun, as I am a huge fan of Jane Austen and Victorian houses. Congratulations, Katherine - sounds like a winner. Another new author! Yay! Congratulations, Katherine! 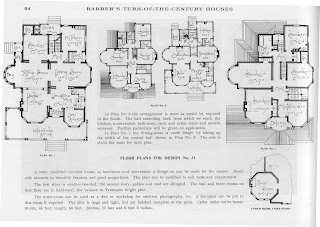 I love it when I have floor plans to go with pictures of great houses--to see how everything's connected, how one would live in the house. Sounds like you're at the beginning of a grand adventure with Emily! Oh, this looks enticing, Katherine. I like how you gave Emily places to read. I hope they include a verandah overlooking the sea. Lucy, I can't go into too much detail about how I used Jane Austen in the story without giving spoilers. The main point throughout the series is that some connection of the case to a classic author's work gives Emily the insight needed to pinpoint the murderer. In Arsenic with Austen, in addition to the love story echoing that of Persuasion, each chapter opens with a quote from Austen, and I've tried to view my characters with something like her wit, insight, and compassion. One Goodreads reviewer caught a similarity to Austen in my style, which makes me very happy. A magic door to the library! OH, how I've always loved magic door-I guess it started with Narnia. Or maybe Clue, with the secret passageway to the conservatory. This sounds like the perfect book for that spot! ANd now I am off to make sure that our 100 year old house doesn't have a secret door--somewhere-I might have missed. Love maps of floor plans and maps of towns too. Congratulations on your new novel! It seems yesterday that we were in the same writing workshop at mystery writing workshop at a local bookstore. Although I have not read the book yet (I look forward to reading Arsenic with Austen), in my imagination the main character, Emily the literature professor, would teach English literature and include some books by Jane Austen? The title would be connected to Emily's profession as a literature professor? Katherine, I am so into your story line and setting already. I've just pre-ordered it after reading your post. I am just about to post on my book blog about some exciting reads for the rest of the summer, and I'll be sure to include yours now. I love that you included house plans in your post. 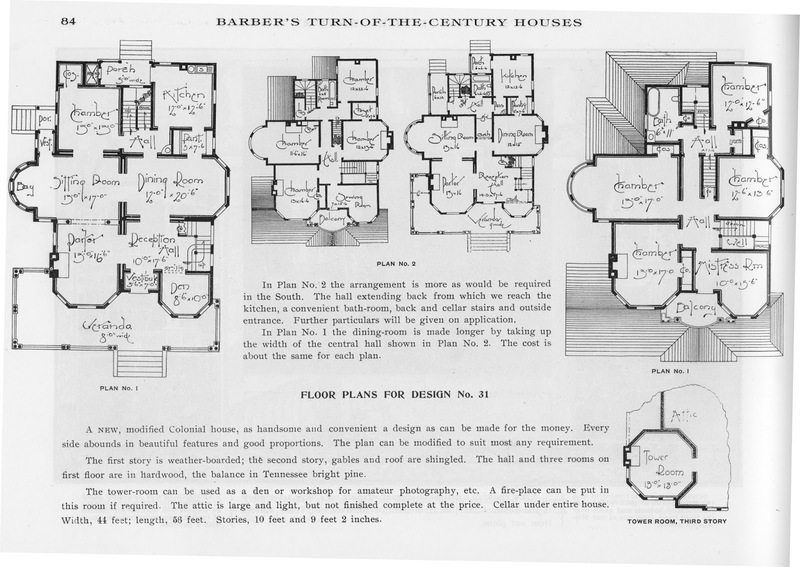 I enjoy looking at house plans, and I especially like knowing the lay of a house like the one in your book as I read it. The picture was lovely, too. I'm also a fan of maps in books, maps of the town or area in which the setting takes place. Debs' Duncan and Gemma series has the most wonderful maps. So, congratulations on your debut book, Katherine. I am looking forward to settling into a great read in my reading chair. I want that house! Darn it. I don't believe I have any well-heeled distant relatives who could take care of me in that fashion. I really like the second chance at love trope, as in Persuasion, and mixing a bit of Austen into the story. I will be looking for your book, Katherine. Katherine, having a reader compare your style to Austen's is always something to crow about! Congrats on your debut, which sounds fascinating. 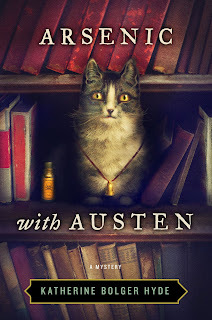 There are so many pastiches on Austin around; as a reader and Austen lover, I welcome novels that are inspired by Jane, but not direct retellings. I'm looking forward to reading ARSENIC AND AUSTIN! Thanks to all for the good wishes and kind words! It's great to know there are so many people who share my love for Jane Austen and old houses. A murder mystery with shades of Jane Austen? I am IN! Can't wait to read this. My dream reading space: the library from Beauty and the Beast, with Mrs. Potts constantly refreshing my teacup. Short of that, I have a cushy rattan chair that I like to curl up in, with a mug of tea and plate of scones or other treat nearby. Delightful, and the floor plan is magnificent. It's so important that the reader has a real sense of place in a book, and that can't happen if the writer doesn't. Well done, and an intriguing read.